Eye On Sports Media: The Mid-Majority: "Sports Information Has Absolutely Nothing to Do With Sports"
The Mid-Majority: "Sports Information Has Absolutely Nothing to Do With Sports"
People who dream of working in sports information departments at major universities, or in media relations for professional leagues, teams, or television networks share a common vision. That vision is that working in these jobs means they can share in the glory of the teams and the athletes. Unfortunately, they are missing out on a key point that might shatter their vision: sports information has absolutely nothing to do with sports, and very rarely to do with information. This is a key lesson that was learned by Kyle Whelliston of The Mid-Majority, as he spent a night "playing" Assistant Sports Information Director at an IUPUI basketball game in December. Here are a few excerpts from his excellent article on the topic as posted at The Mid-Majority. Sports information is like electricity or water. When the power's on and everything's flowing regularly, nobody notices. Everybody takes these things for granted. But whenever anything goes wrong, people act like it's the end of the world. Sports information directors are expected to be perfect, to have the entire school record book on the tip of their tongues, to make sure everything along every scorer's table runs correctly and efficiently during games. And they usually are perfect, spending their days in perfect anonymity. Which is why they're the true saints of this business, the unsung heroes of Our Game. If you believe that heaven is the inverse of earth, SID's will inherit mansions in the clouds, white Lamborghinis and front-row Elvis tickets. The job is so thankless, and there is so little respect afforded them, that when they're quoted in a news story, it's usually as "university spokesman." It's as if "sports information director" is a synonym for "sanitary worker." And who would want to interview the janitor, anyway? Ed brought out a white three-ring looseleaf binder. "This is a very rare object," he told me. "There are only two of these in existence." It was the 2009-10 Jaguars media guide. It's available online, but the school has joined many others south of the Red Line by not printing a glossy-covered version. I asked Ed if this was part of a green, planet-friendly initiative on the part of IUPUI. "No, our print budget's been slashed," he explained. Dammit Jim, I Was a Journalism Major, Not IT! The fun ended with the evening's first emergency. The Tribune-Review writer had trouble getting on the wireless internet; there was a login screen that kept asking him for a password. As the teams warmed up with a three-song rap selection echoing off the Jungle's walls, Ed spent the last 45 minutes before game time frantically trying to set up a guest account on the IUPUI system, coordinating with the school's information technology department. SID's have to be jacks of all trades, MacGyvers in coats and ties. Sometimes, they have to be IT guys. Umm, I Think the Problem Is Here: Assistant Sports Information Director for a night Kyle Whelliston of The Mid-Majority tackles a vexing sports information issue, a faulty printer, as members of the media wait impatiently. Photograph courtesy of The Mid-Majority. With the crisis passed, Ed gave me my in-game marching orders. My primary job would be distributing in-game box scores. I was to sit on the end of the scorer's table near the IUPUI bench (which means getting towels and empty cups thrown at you all night by demonstrative head coach Ron Hunter), and spring into action during media timeouts. I was to run down to the middle of the row to where staff member Adrian Katschke ran the Stat Crew software, and grab the eight copies of the box score from the printer at his station. I had a delivery route: visitor's bench, visiting radio, visiting SID, home SID, home radio, and home bench. Benches got two copies. 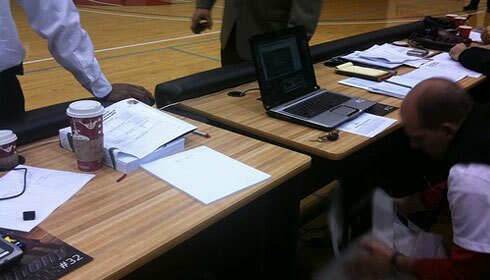 The two writers at the side table only got service at halftime and at the end of the game. I cannot recommend the reading of this article enough, and it really should be required reading in all journalism and sports management programs. Oh, and one last thing. The next time you are working at an event, thank your sports information director or media relations professional when things go smoothly. If things don't go smoothly, just give them a hug and say "everything will be ok."